When you may be pregnant, the earlier you know, the better. 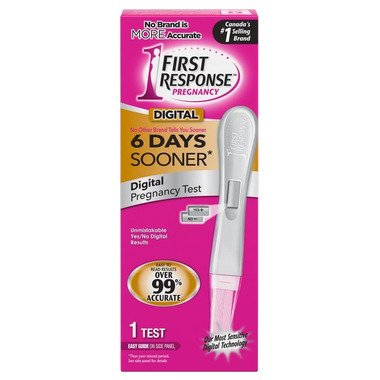 Featuring Enhanced Technology, this digital pregnancy test is sensitive enough to capture scant amounts of pregnancy hormones to give you results 6 days sooner than your missed period (5 days sooner than your expected period). The first few weeks of pregnancy are critical to fetal development, so early prenatal care is important for a healthy birth weight and the baby’s survival. The sooner you know you’re pregnant, the sooner you can begin making healthy pregnancy choices for yourself and your baby that include: diet, nutrition and limiting your exposure to hazards. Some pregnant women may not have detectable amounts of the pregnancy hormone in their urine on the day they use the test. The amount of pregnancy hormone increases as the pregnancy progresses. In laboratory testing, FIRST RESPONSE™ detected the pregnancy hormone levels in 60% of pregnant women, 6 days before their missed period; in 86% of pregnant women, 5 days before their missed period; in 96% of pregnant women, 4 days before their missed period; in >99% of pregnant women, 3 days before their missed period; in >99% of pregnant women, 2 days before their missed period; in >99% of pregnant women, 1 day before their missed period; and in >99% of pregnant women, on the day of their missed period.